King's Quest II: Romancing the Throne was the second game in the King's Quest series. King Graham travels to a faraway land to rescue the beautiful Valanice from a witch who has imprisoned her in an ivory tower. 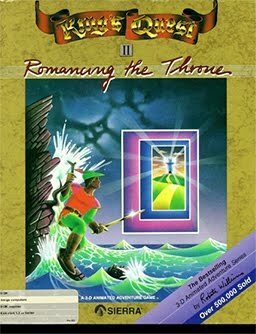 King's Quest II is now supported by ScummVM, a program designed to let 2D adventure games run on multiple platforms. With ScummVM, King's Quest II now runs on modern versions of windows, as well as Linux, Mac OS X, and many consoles such as Dreamcast, Wii, PlayStation 2, and PlayStation Portable. For a complete list of platforms supported by ScummVM, see here. In 2002, a fan remake was created by Tierra Entertainment, now known as AGD Interactive. It was made with Adventure Game Studio and was created in the style of Sierra's later SCI remakes. It had enhancements to the interface, graphics, music, and voice acting. It also has a revised storyline that follows an unofficial timeline that continues in their King's Quest III remake, and additional dialog and puzzles that were not in the original game.